Just as the U.S.D.A. 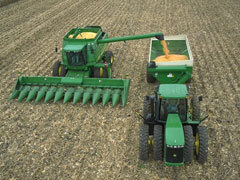 reports a record corn harvest for Iowa producers, Quad Cities-based Deere and Company reports a huge boost in earnings for the fourth quarter, thanks in large part to agricultural equipment sales. Bill Ratzburg, Deere’s investor relations director, headed up today’s earnings report, carried live on the Internet. “This morning, Deere reported record fourth quarter net income of 422-million dollars on record fourth quarter equipment operations net sales of 5.4 billion dollars,” Ratzburg says, “on a continuing operations basis, income increased 53% and diluted earnings per share rose 57%.” The company announced a two-for-one stock split last week and he says the per share results don’t reflect that split. Deere expects earnings next year to hit two-point-one billion dollars with 325-million in profits during the first quarter. Meanwhile, the latest U.S.D.A. crop report shows Iowa corn producers harvested a record 2.4 billion bushels this year from another record of nearly 14-million acres.